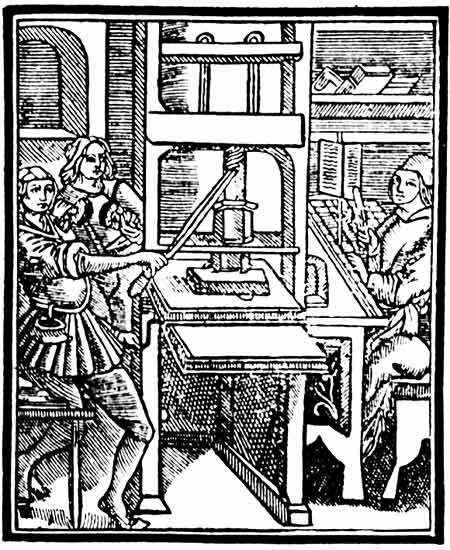 This page documents the evolution of printing and publishing during the fifteenth century. The main event from this era is Gutenberg’s invention of a printing press that works with movable type. It revolutionizes the production of books and pamphlets. By the end of the century printing presses can be found in more than 250 cities around Europe. Such presses can produce 3,600 pages per workday, compared to forty by typographic hand-printing and just a few pages by hand-copying. One of the main challenges of the industry is distributing all these works. This leads to the establishment of numerous book fairs. The most important one is the Frankfurt Book Fair which is first held by local booksellers soon after Gutenberg’s invention of the printing press. Even though woodcut is already used for printing on cloth for over a century, the first European woodcut printing on paper happens in the early 15th century. It is used for printing religious images and playing cards. Woodcut is a relief printing technique in which text and images are carved into the surface of a block of wood. The printing parts remain level with the surface while the non-printing parts are removed, typically with a knife or chisel. The wood block is then inked and the substrate pressed against the wood block. The ink is made of lampblack (soot from oil lamps) mixed with varnish or boiled linseed oil. This printing technique is also called block printing. 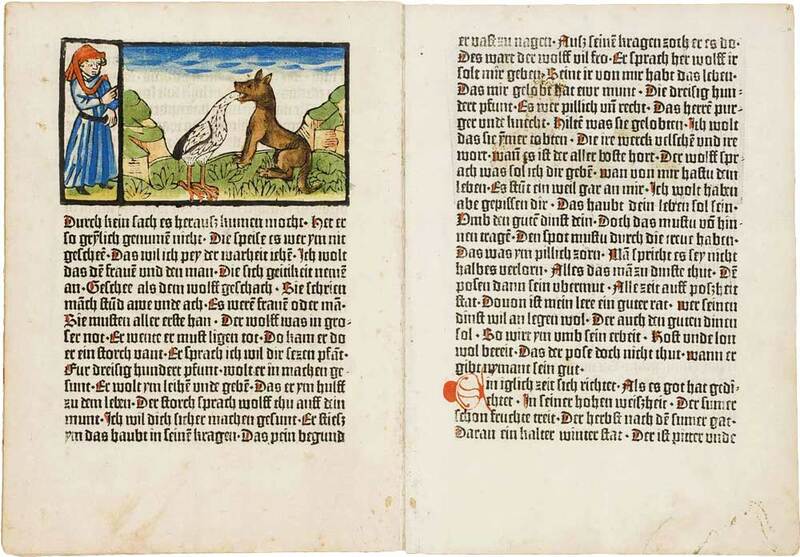 The first block books are produced in Germany and Holland around 1430. 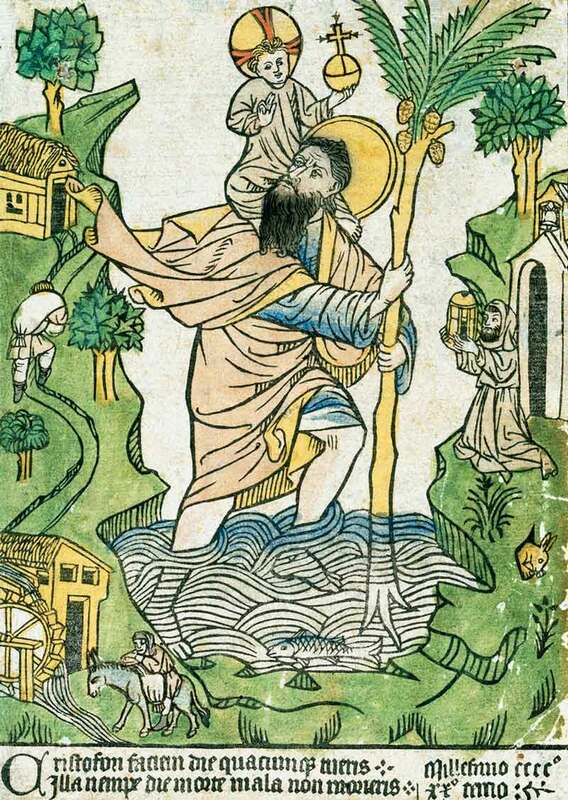 One of the earliest examples of European woodcuts is the image of Saint Christopher shown below. It was printed in 1423 and then manually colored in. Books are still rare since they need to be laboriously handwritten by scribes. The University of Cambridge has one of the largest libraries in Europe – constituting of just 122 books. The parchment that books are written on is so expensive that books that are no longer relevant are not thrown away. The old text is scraped off and replaced by a a new one. These reused books are called palimpsests. Using UV light historians can often still read the original text, making these books an important source for ancient texts. It takes him four years to finish his wooden press which uses movable metal type. The image below shows a replica of a press from that era. It uses relief printing: at the bottom left a frame holds the columns of text that get printed. This type consists of individual letters set in lead. After inking the type, a sheet of paper is put on top. Next, the frame is shoved to the right underneath the platen. By moving the large handle pressure is applied to make sure the ink is transferred to the paper. Afterward, the bed is moved back to its original position and the paper can be removed. The press itself is based on the wine presses that were already in use for centuries in that region. Relief printing, through woodblock printing, also isn’t new. Movable type had already been used in the East. What Gutenberg does is bring these various technologies, including the proper type of ink, together. His real innovation is the molding system that enables a printer to create as many lead characters as are needed for printing a book or pamphlet. Among his first publications printed using movable type are the ‘Poem of the Last Judgment’ and the ‘Calendar for 1448’. 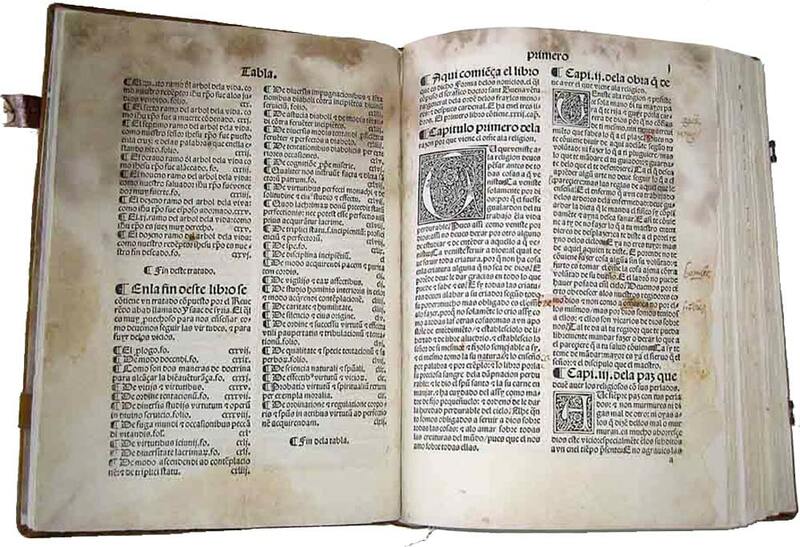 Around 1450 Gutenberg begins printing bibles. The first edition has 40 lines per page. Constantinople is captured by the Turks. Many books from its Imperial Library are burned or carried away and sold. This marks the end of the last of the great libraries of the ancient world. 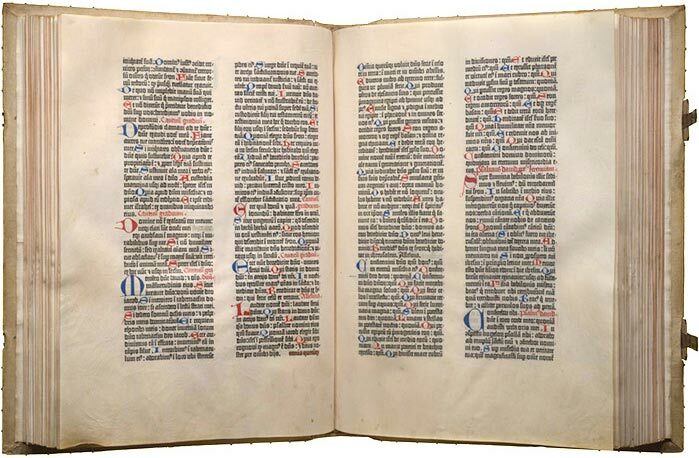 Gutenberg prints around 180 copies of a 42-line bible which is referred to as the Gutenberg Bible. It is considered the first mass-produced book. The text is set in gothic type. Customers can have their copy decorated manually. 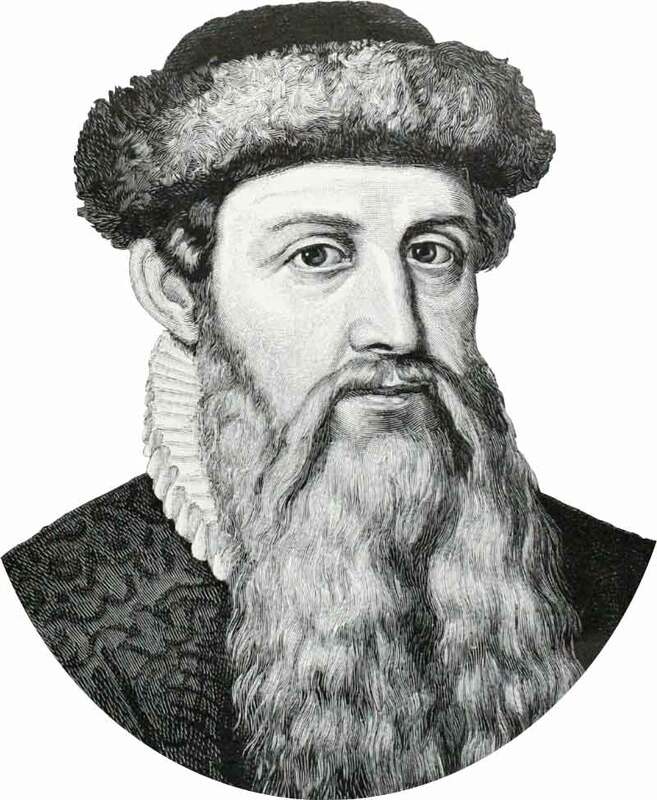 Ironically enough Gutenberg goes bankrupt in 1455 when his investor Johann Faust forecloses on the mortgage used to finance the building of the press. Faust gets hold of the printing equipment as well as the copies of the bible that have already been printed. While trying to sell them in Paris Faust tries to keep the printing process a secret and pretends the bibles are hand copied. It is noticed that the volumes resemble each other and Faust is charged with witchcraft. He has to confess his scheme to avoid prosecution. The first known color printing is used in ‘Mainz Psalter’, a book containing a collection of psalms. It is printed by Johann Faust and his son-in-law Peter Schoffer. Color, in this case, does not mean full-color images but simply the use of a second color to highlight some initials, words or paragraphs. The Psalter is also one of the first books to contain a colophon, a page or part of a page that describes who printed the book, the location of the printer and its production date. Albrecht Pfister prints the first illustrated books using a number of woodcuts that are colored in manually. The example below is from a book of fables called Der Edelstein. Another of his books, the Biblia Pauperum, also contains many hand-colored illustrations. Pfister is also one of the first to print books in the German language. 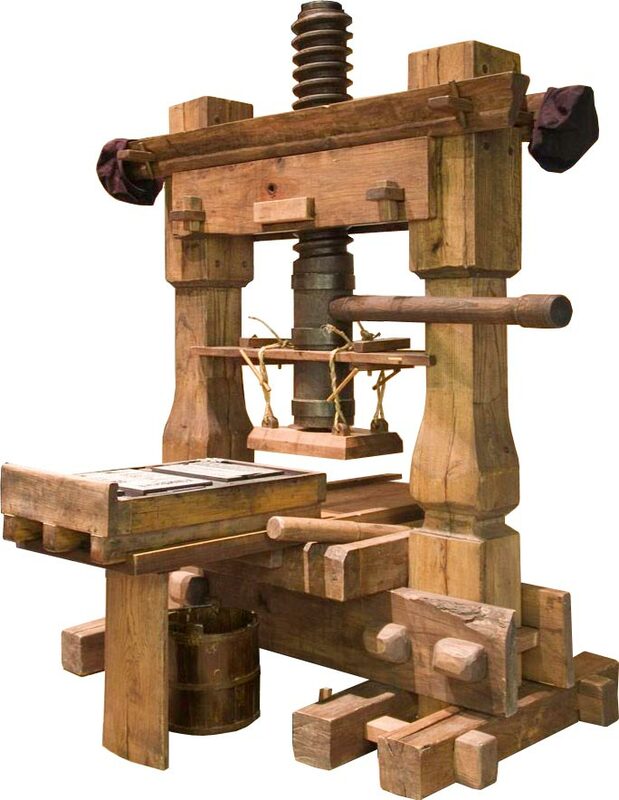 German monks operate the first printing press in Italy in the Abbey of Santa Scolastica at Subiaco. In 1467 Ulrich Haan (Udalricus Gallus) is the first one to print books in Rome. Haan had emigrated after his letterpress print shop in Vienna was destroyed because he had dared to print a lampoon against the mayor. The first book to be printed in the Italian language is Il Canzoniere by Francesco Petrarca in 1470. In Bruges Colard Mansion prints De cas de nobles hommes et femmes (De Casibus Virorum Illustrium), the first book that is illustrated with engravings. An engraving is made by incising a metal plate with a tool called a burin. This plate is then warmed up so that the ink applied to it becomes fluid and also fills all those tiny holes and lines. Next the ink on the flat surface is swiped off, so that only the nooks and crannies are still filled with it. A slightly moistened paper sheet is placed on the plate and sent through a rolling press. Its pressure makes sure the paper picks up the ink from the drawing. The process is more cumbersome and slower than woodcut printing but engravings are more robust than woodcuts so that more copies can be printed. Drawings can also be more detailed. Over time this technique will replace woodcuts. Colard also prints the first books in English and French. Another famous engraver from that era is the Master of the Housebook, a south German artist whose ninety-one prints are extremely rare. In their print shop in Venice John and Wendelin of Speier are probably the first printers to use pure roman type, which no longer looks like the handwritten characters that other printers have been trying to imitate until then. Another printer in Venice, Nicolas Jenson, produces a more distinguished roman font which still serves as a model for type designers today. Sinodal de Aguilafuente is the first book printed in Spain and in the Spanish language. Its printing was ordered by the bishop of Segovia, which is why printing did not take off first in any of the major Spanish cities, like Barcelona or Madrid. ‘De honesta voluptate’ (On honourable pleasure) is one of the first printed cookbooks. It is as much a series of moral essays as a cookbook. Ten years later ‘Kuchenmeysterey’ (Kitchen Mastery) becomes the first printed German cookbook. William Caxton buys equipment from the Netherlands and establishes the first printing press in England at Westminster. Books printed by Caxton include Chaucer’s ‘The Canterbury Tales’, ‘Fables of Aesop’ and many other popular works. Caxton is also the first English retailer of printed books. The painting below depicts Caxton showing his printing press to King Edward IV. There are around 40 printing shops in both Germany and Italy. In the Netherlands printing takes place in 21 cities and towns. Dutch printer Gotfried van Os (Gotfred of Ghemen) establishes the first print shop in Copenhagen. De laude scriptorum manualium is a book by the German Benedictine abbot Johannes Trithemius in which he criticises the effect that the printing press has on the customs and devotion of the brotherhood of monks. Only by copying the Scriptures can a scribe become in touch with the Word of God. The abbot is a complex man who actually sees that printing also offers advantages. He expands the library of his abbey from around fifty items to more than two thousand, many of them printed. His own treatise also is printed since that is the most cost-effective way to spread the message. Anton Koberger, a publisher and printer in Nuremberg, prints his most famous book, the ‘Nuremberg Chronicle’. It is illustrated with hundreds of woodcuts, many of them portraits. These portraits are all imaginary and the same block is often used to depict different persons. 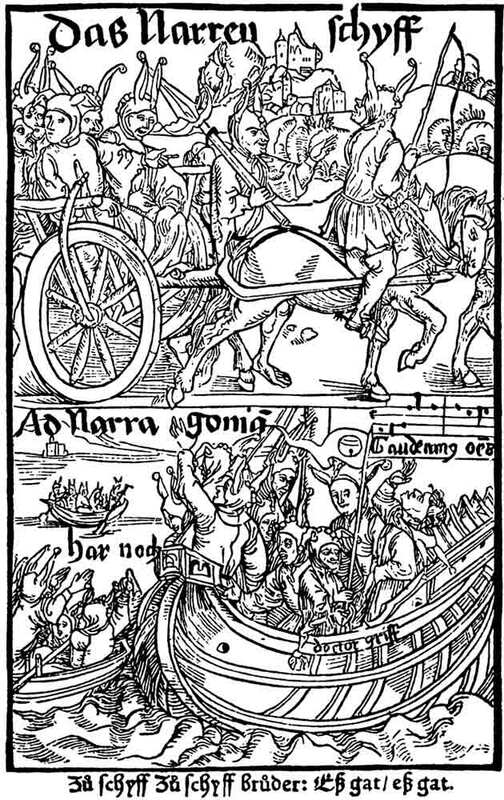 Das Narrenschiff (The Ship Of Fools) by Sebastian Brant is published in Basel, Switzerland. This satire about the state of the church is illustrated with woodcuts from the great Renaissance artist-engraver Albrecht Dürer. It quickly becomes extremely popular, with six authorized and seven pirated editions published before 1521. Dürer’s own ‘Apocalypse’ is another very popular book of that era, published simultaneously in Latin and German. 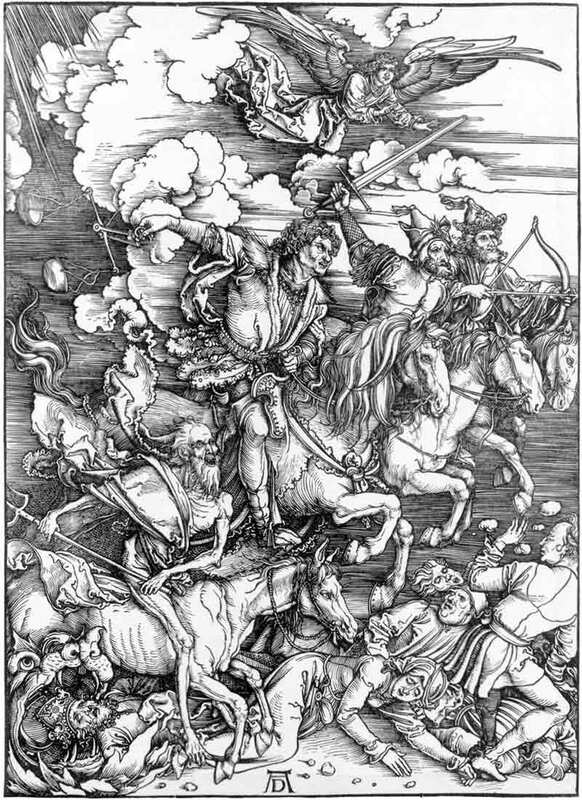 Prints of the detailed woodcuts, such as The Four Horsemen of the Apocalypse shown below, are also sold separately. The first printed books are published in Danish and Swedish. Aldus Manutius, who had helped found the Aldine Press in Venice in 1494, is the first printer to come up with smaller, more portable books. Until then books are large and heavy, meant to be read while standing at a lectern or reading stand. Manutius’s books are smaller and can be carried around and read anywhere. The book format is called an octavo (‘in eight’) because each press sheet is folded three times to create eight pages. Manutius is also the first to use Italic type, designed by Venetian punchcutter Francesco Griffo. 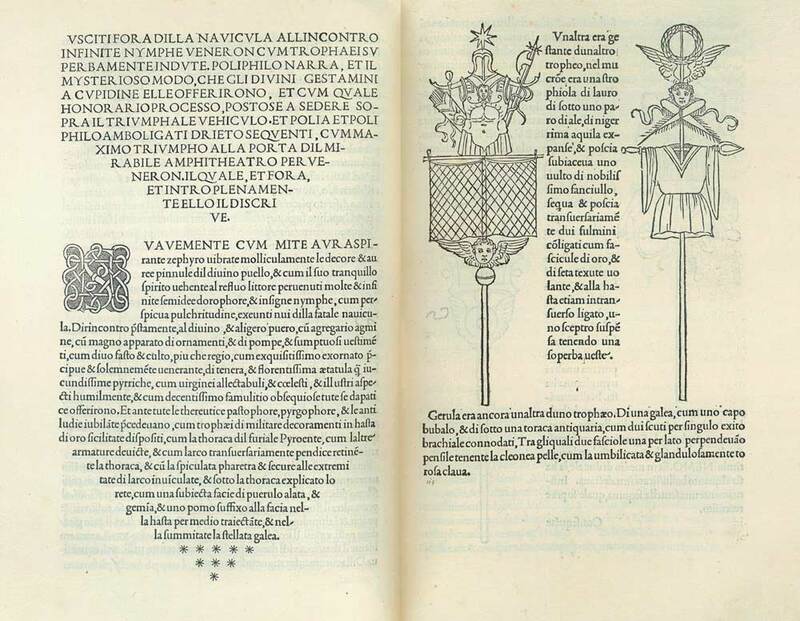 In 1499 the Aldine Press prints Hypnerotomachia Poliphili, an illustrated book set in Bembo. It is considered one of the masterpieces of Renaissance publishing. Reading this for the very first time because I was given as an assignment in a Printing Technology Class really makes me more interested in knowing more about Printing. Good Job! It seems like it wouldn’t be that interesting, but printing history is really quite fascinating, especially when you think about all ripples that printing caused in society and politics.